Without great content, a website won’t succeed. Yes, we build attractive sites, but we also can create custom content that delivers traffic to your site and your business. We know what you’re thinking. There’s a bunch number of companies building websites in Greenville, Spartanburg and Anderson (and everywhere else). Why does the Upstate need another website builder? For starters, we don’t build websites for everyone. If you’re looking for a personal blog site, we’re not for you. Conversely, if you need a huge site that sells thousands of products, we’ll guide you to one of our partners. We specialize in websites for small businesses. We create websites with rich content that gets you noticed. And we do it at a price you can afford. While website design is a big part of of what we do, we also offer personalized content-creation services for the websites we create. It’s a natural fit, because without great copy and photos, your website won’t be effective. We can purchase stock photos like any other website design company, but we can also come on site to your business and set up a custom photo shoot so your website is all about you — and your business. We’ve taken photos and written content for major print and online publications, including The Greenville News, TALK Magazine, Upstate Parent, GreenvilleOnline.com and GoFlashWin. We’ve also handled commercial shoots for major companies and retail businesses in the Upstate, including Wynit and Big Air Trampoline Park through our Art in Light Photography division. Content and design are important, but we’re experts in that backside work — domain and site management. All of our sites are responsive, which means they adjust to the viewing device — phone, tablet or computer. We never use Flash in our websites, so they work well on all devices. When we build a site for your business, we do it right the first time. From great content and design to domain management and email provisioning, we can handle it. We can help your business look its best online. That means more customers and, ultimately, more profits. Want to learn more? Contact us today to find out how we can help you make your mark online. The TechGraphics team recommends and is experienced with Microsoft Exchange 365, having deployed it in numerous companies during the last year as we migrated all of our customers — and others — to this platform. Whether you’re on a Mac or PC, this is an extremely affordable, secure, manageable and scalable solution for your business — whether you have one employee or 100. We can set up, migrate and deploy Microsoft Exchange 365 to your business affordably and efficiently. We can also assist with the purchase; the price is no different no matter where you purchase, but we can ensure you’re properly set up for a business/teams approach. If you need a domain, we can assist with the purchase and setup through our PCMacDomains division. Or, you can visit the site yourself and search and register your own domain quickly and affordably. PCMacDomains is a domain reseller started by our late former associate, Noel Materna, a number of years ago. We have many happy customers, and plan to continue to offer this service. OK, not this. Scroll down first. Here are three of the many sites we’ve built. Take a look around, get an idea of our capabilities, and check out our customers’ services, too. Bradham Printing is a small commercial printer in Greenville, South Carolina. They wanted a clean, functional site that focused on the services they offer to their customers — primarily small business and industrial firms. This site accomplishes that, and allows customers to easily and safely upload files. Upstate Montessori Academy in Greenville, South Carolina, is a new school that offers a Montessori curriculum with a hip, fresh, cool slant. Their website reflects their focus and dedication to education. It offers information for parents of current and prospective students, and is updated monthly with new content. 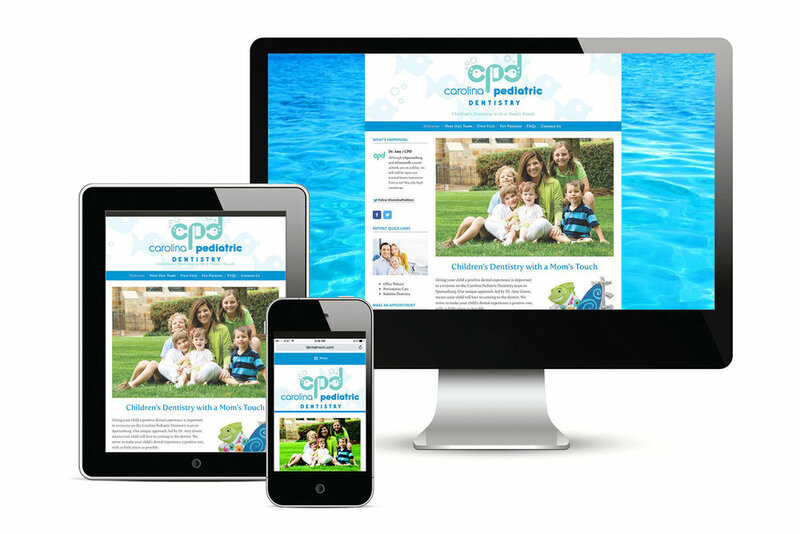 Giving your child a positive dental experience is important to everyone on the Carolina Pediatric Dentistry team in Spartanburg, so we designed a mom- and kid-friendly website that’s colorful and full of images from the CPD office. We spent time with the CPD team and custom generated all the content on this site.